I've found the perfect planner. Perfectly customized to my needs, perfect for keeping track of everything important to me, and worth every penny. Hands down, this is the best planner I've ever had. And I've reviewed MANY planners, so you know I know what I'm talking about! Here's the deal: I've been on the quest for a perfect planner for years. I wanted one that only tracked the things I WANTED to track, not a bunch of extra boxes and and spaces that I wouldn't use. I would either find a planner that had too much clutter, or not enough space. Too few planning areas, or far too many. Until I found Agendio. Let's start with the cover – Agendio has a limited number of cover options available, but I'm completely OK with that because I've gone the Erin Condren route and ended up with lots of cute covers that I never got to see, because I leave my planner open so I can use it all day. I picked this pretty blue cover, which has a clear overlay to protect it. Now for the fun stuff – Agendio has TONS of customizable options. I mean, TONS OF THEM. I started my planner by adding pages for our daily schedule (above). I added a schedule for each day of the week, then a week's worth of additional blank schedules. I was able to “draw” this schedule with their custom tables. I inserted the weirdly random times we change tasks throughout the day, and added each of the kids' names at the top (I blurred them out, because I don't post the kids names online). If you've used Managers of Their Homes, and schedule your days, this printed schedule will be an amazing help to you. If you don't schedule your days, but follow a routine, you can customize the pages to reflect a routine instead. OR you could do something completely different – like your daily tasks. It's completely customizable and completely up to you! After my daily routine/schedule pages, I have the customizable daily planner pages. This is where Agendio truly shines. I chose nearly every component to this page, and I love everything about it! You can choose from a variety of layouts, then customize the boxes and content. I have a large planner with a weekly layout – Monday through Friday on the left, then the weekend and some customizable checkboxes on the right (see the full layout below). In the photo above, I picked a pretty blue color for January (yes, you can choose your own colors!). You can choose how you want the dates to appear, and while I really loved the month/date/day of the week format, you can pick your favorite. I made the top box my “Goals for Today” box. I write my daily goals and priorities to help me stay on track. You can click here to see the exact layout and customizations I chose for my weekly layout – just click on the planner outline to see the details! I decided to split my days into Morning/Afternoon/Evening, because categorizing my days that way helps me to stay productive. I added sections to the bottom for “Daily Gratitude” where I can track what I'm thankful for, and Meals on the bottom so I can plan what we'll eat. One of my FAVORITE components to the Agendio planner is that you can type in your recurring events, and they will automatically print them for you! For example, Monday is always laundry day around here, so I put that in as a recurring event. This is a brilliant feature that has already saved a lot of time. This is my weekend view – the current and next month are in the shaded area to the upper right. I added boxes to the side for checklists. I have Work Time Blocks, Cleaning & Organizing, Homeschool, Work Tasks, and To-Do's. This is pretty much perfect for customizing the different areas of your life and keeping track of what needs to get done. After each weekly layout, I have a page split into “Meals” and “Shopping List”, then another page for weekly habit tracking (which is SO helpful!). I have my daily cleaning tasks and habits listed here, as well as vitamins, Bible reading, and other habits I'm working on each week. I chose to add tabs to help me easily navigate to each month. 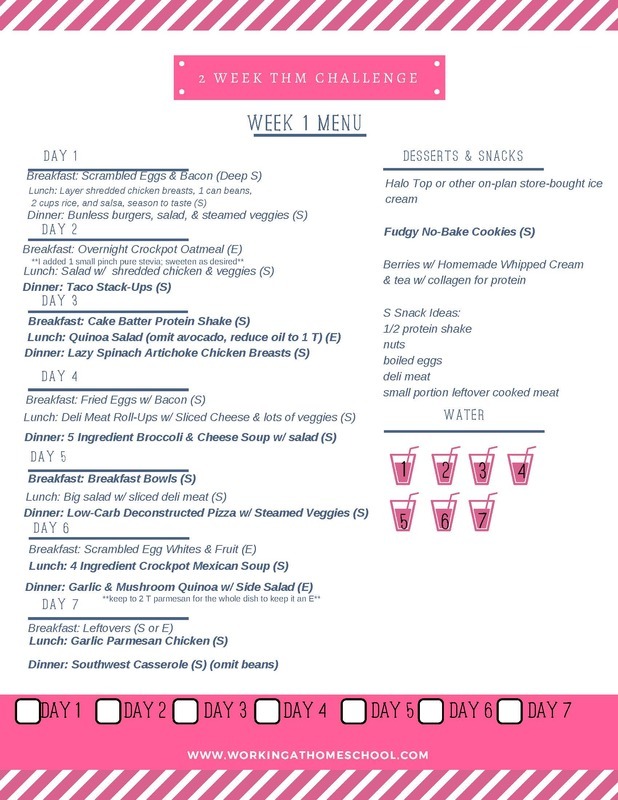 In each monthly tab there is a weekly spread followed by the Meals/Shopping List page, then the Habit Tracker, followed by the next week, and so on. The tabs are color coded to match the colors I chose for the weekly spread, and continues through 2018. The book “The 12 Week Year” has revolutionized my life as a working, homeschooling mom. I added pages to the end of the planner under a “Notes” tab to help me plan in 12 week increments. I added graph paper for “Projects” and lined checkboxes under a page for “Home Projects” – one side for indoor projects and one for outdoor projects. I added additional dot-grid pages for Notes in my Notes section…just because I could! I love the customizable types of note pages you can add at the end. At the very end of my Agendio planner are twelve detailed Budget pages, fully customized for me. I have one for each month. That's the end! This is the only planner I've ever had that I've used for months with no problems, no complaints, and no desire for anything different. This one is a game-changer. I plan to film a video to help you customize your Agendio, but in the meantime, I really recommend building your own at Agendio.com to see what it's like! A friend of mine and I spent some time building planners on their website before we settled on the perfect layouts, and we both agreed that it was the most fun we'd had online. It's strangely relaxing – give it a try! Do you have a referal link ? Hi! I don’t have a referral link anymore – I still love the planner and still use mine, though! I hope you enjoy it – thanks for checking in! That’s so nice of you!